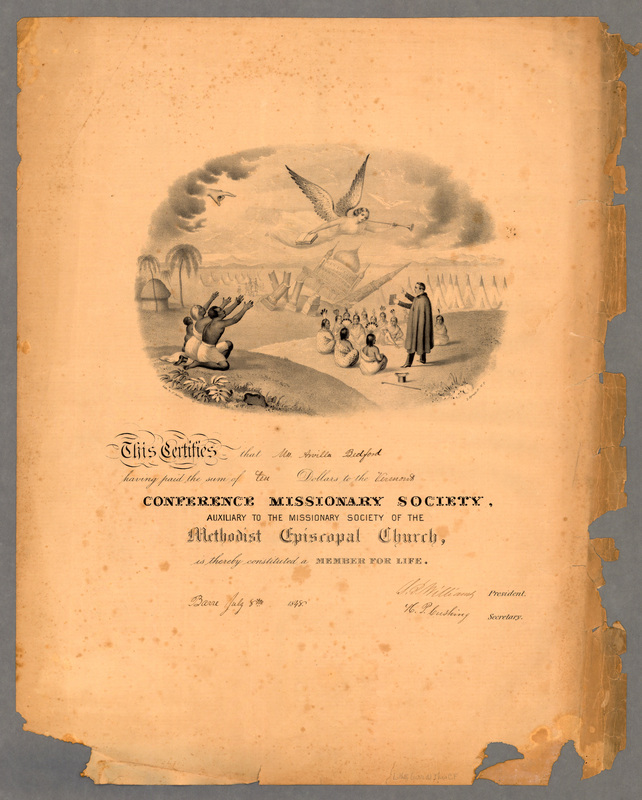 N. Currier, Membership Certificate to [Vermont] Conference Missionary Society, 1848, via American Antiquarian Society. The Second Great Awakening moved American evangelicals to proselytize at home and abroad. The image on this lifetime membership certificate to a missionary society shows how the new member’s money will be used. The guiding hand of Providence and an angel bearing a book (presumably a Bible) hover at the top of the image. In the background, a mosque topples over. An African family kneels and reaches towards the heavens on the left side, while a minister preaches to Native Americans gathered before him on the right.